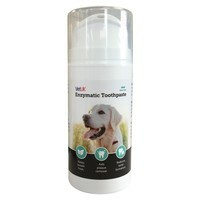 VetUK Enzymatic Toothpaste has been developed with an advanced triple action formula that helps to reduce tartar, remove plaque and reduce bad breath in both cats and dogs. Designed with an enzyme complex that is continuously active against plaque, gingivitis, dry mouth and bad breath, the easy-to-use toothpaste has also been given a delicious meat flavour to offer high palatability. Apply the Enzymatic Toothpaste directly on to a toothbrush, ensuring the size of the toothbrush is suitable for your pet. Enzyme Complex (Lactoferrin, Lactoperoxidase, Lysozyme, Isothiocynate Salt, Glucose Oxidase), Silicon Abrasive Bead, Zinc Chelate, Excipients, Meat Flavour. Tried this for the dog, initially she was not keen on the product but has grown to like it! I bought this instead of Logic Oral Hygiene Gel because there was an offer of free delivery with purchase of a VetUK product. In response to my email, the helpful sales team had let me know its active ingredients and I'm satisfied it works as well as the other brand. Certainly my cats find it just as palatable. However, its plastic pump container can be a hassle. The first pump I bought stopped pumping after only one use, but the helpful sales team quickly replaced it for free when I rang. The next one was fiddly for the first several uses, but now seems to function ok.